Sophia is a joyful theme with many options to change what the visitor of a website will perceive. For its features, please see paragraph 2.2 Theme configuration. Tips for this theme are discussed in 3. The theme in practice:tips. In this chapter we only discuss the features that are specific for this theme. The general features that apply to most themes are treated in chapter Theme Frugal, paragraph 2.2 Theme configuration. Please also check The module in practice and For visually impaired. More Bazaar Style Style features can be found in chapter Bazaar Style Style. A short, general description: an 'inverted L' theme. That is, the character 'L' turned 90 degrees clockwise. In that way, the long side of the L is the header showing the sections, while the short side shows the items, selected in the header. 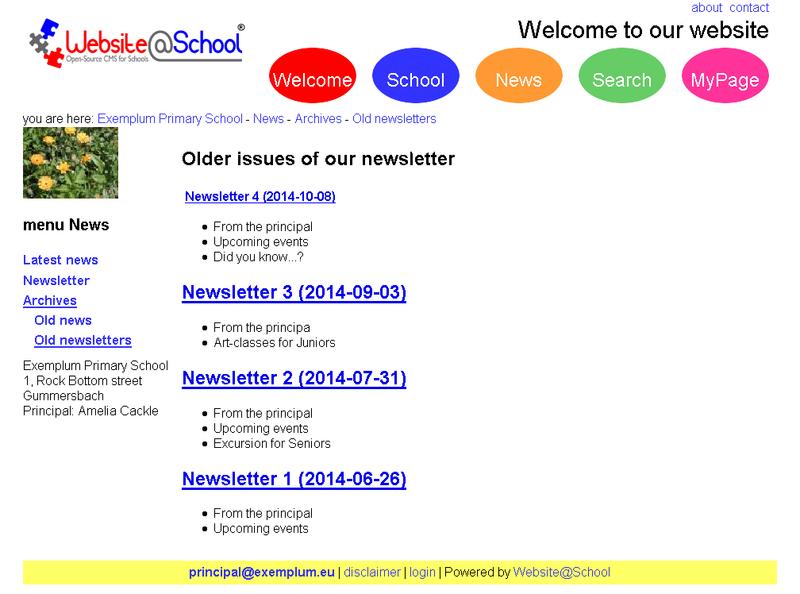 In the header, from left to right: a logo, the sections 'Welcome', 'School info', 'News', 'Search' and 'My Page' These section names are embedded in configurable (default ellipse) colored shapes. Above the sections are a configurable text and the top links. Below the header is the breadcrumb trail. Below the breadcrumb trail are the menu and content panes. The menu pane, taking about 20 % of the screen width, is a vertical pane (the short side of the inverted L), containing a configurable space (default a demo picture) and below that the content of the selected section, i.e. pages and/or sub-sections. 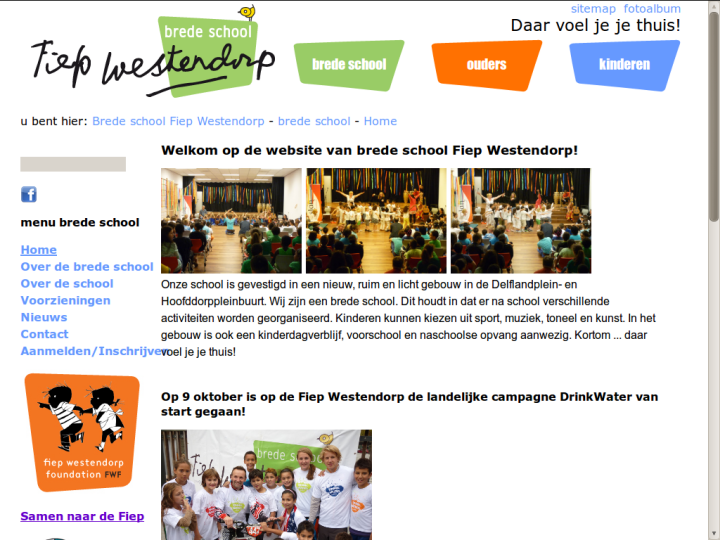 At the bottom of the menu pane is a configurable text, in the demo it contains the address of the Exemplum Primary School and the name of its principal. The remaining 80 % at the right side of the menu pane is page content. 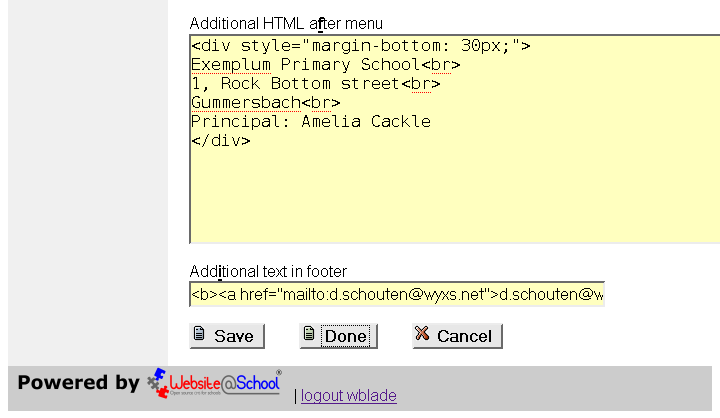 The footer contains a configurable line (now an e-mail-address), the bottom links and the 'Powered by Website@School' link. The basic properties, i.e. Edit basic properties of this area are discussed in chapter Configuration Manager, paragraph 3.3 Edit basic properties of this area. For most configuration options, please see chapter Theme Frugal, paragraph 2.2 Theme configuration. Printer friendly stylesheet: Please see chapter <"themes_axis.html" target="_blank">, paragraphs <"themes_axis.html#2.2" target="_blank">2.2 Theme Configuration and <"themes_axis.html#3.4" target="_blank">3.4 Printer friendly style sheet. Static style sheet usage, Static style sheet, Extra style usage (area), Extra style at area level, Extra style usage (node): These Bazaar Style Style options are Style Style options are the same for every theme and are extensively discussed in chapter Bazaar Style Style, paragraph 4.1 BSS at Area level. 'Anything' can be put here, text with HTML markup, images, etc. Additional text in footer: Default the reply-to address from the webmaster is shown here. Any address or text can be entered here, beautified with HTML. The procedure is the same for every theme. 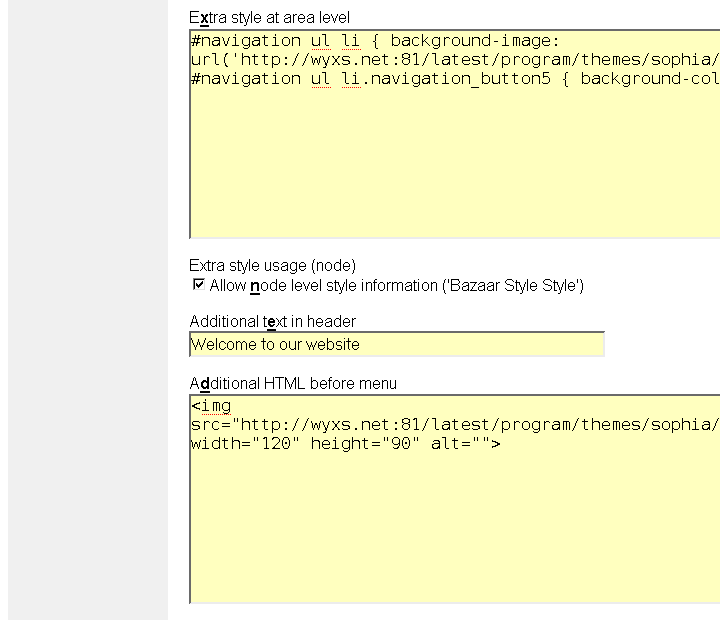 Please see Configuration Manager, paragraph 3.5 Reset properties of theme themename for area n (Area Name) for details. Maybe it's a nice exercise to get rid of the 'Welcome to our website' text and make a bigger, fancier and beautiful header. By selecting one of the stencil files the shape can be altered. 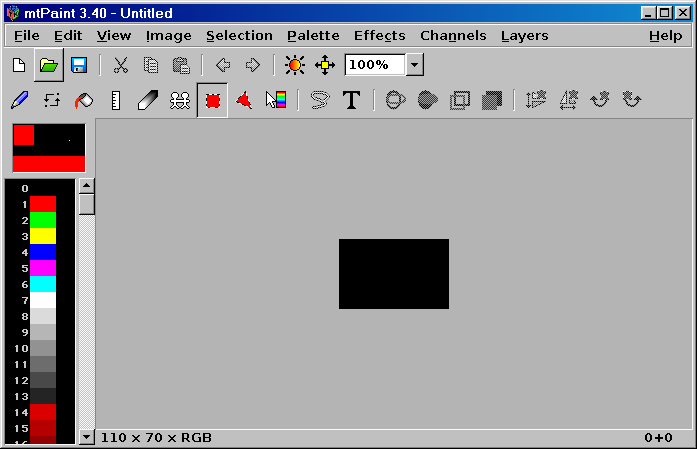 "mtPaint is a painting program which Mark Tyler developed from scratch so he could easily create pixel art and manipulate digital photos. [...] and runs on PC's via the GNU/Linux or Windows operating systems. Due to its efficient design it can run on older PC hardware. 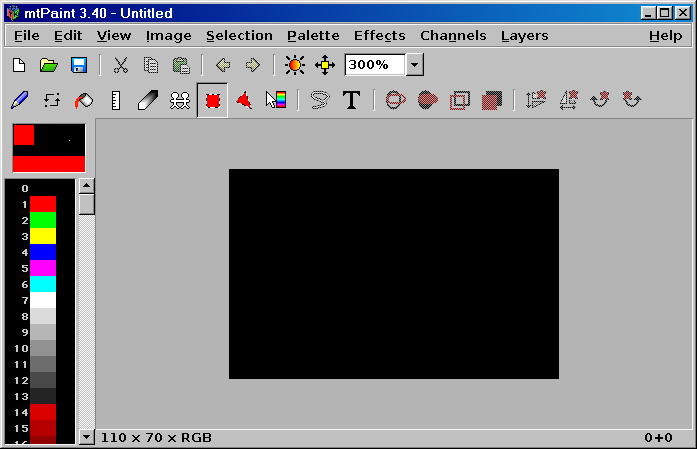 [...] mtPaint is free software, which means you are able to freely use, modify and distribute it according to the GNU General Public License." 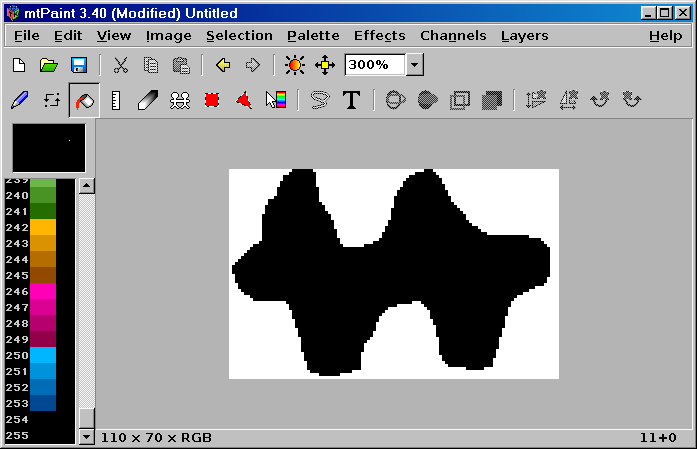 mtPaint is available in many languages and has an excellent manual. 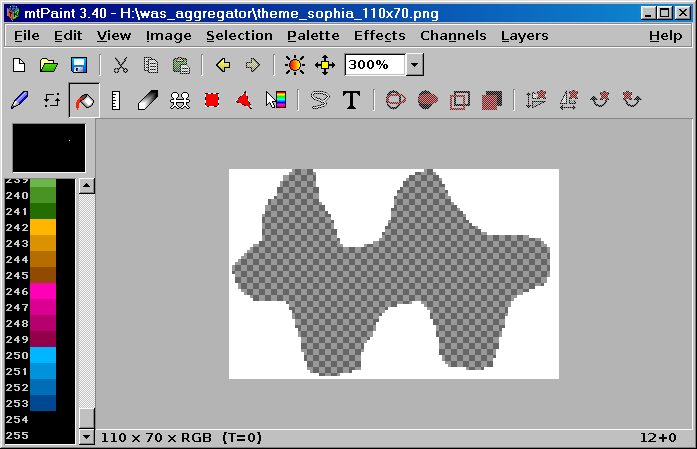 In Linux, Mac and Windows the free GIMP (GNU Image Manipulation Program) can be used. Select the desired color of the stencil, i.e. the non-transparent color. Use the left bar to click the color. In this case it's white. With the bucket tool fill the canvass with the desired stencil color. The complete canvass becomes white. Change the color to pure black (#000000) by picking color 255 from the colors bar. With the paint tool (most left icon in the tools bar) draw the outline of your stencil. If necessary, use [Ctrl + Z] to undo. Let both ends of your line meet so that filling the shape will not leak. With the bucket tool, fill the inner part of the shape. 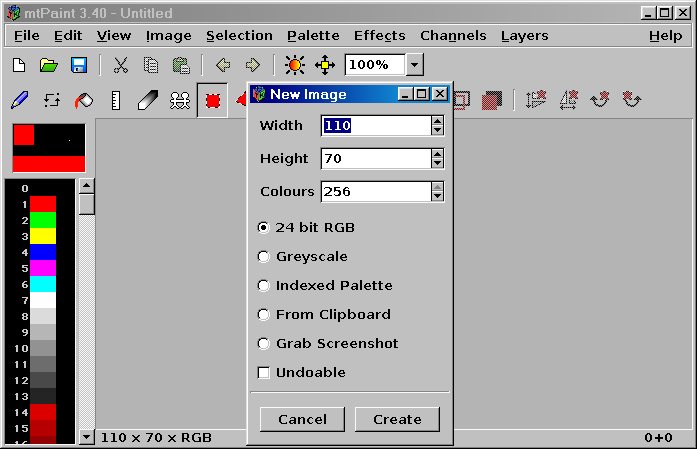 Notice the stencils in 'MyPage' and 'Top Menu'. These stencils were created with stencil6.png and stencil8.png. Most times you will have no direct access to the place where the stencil and image files, belonging to theme, are located, i.e. 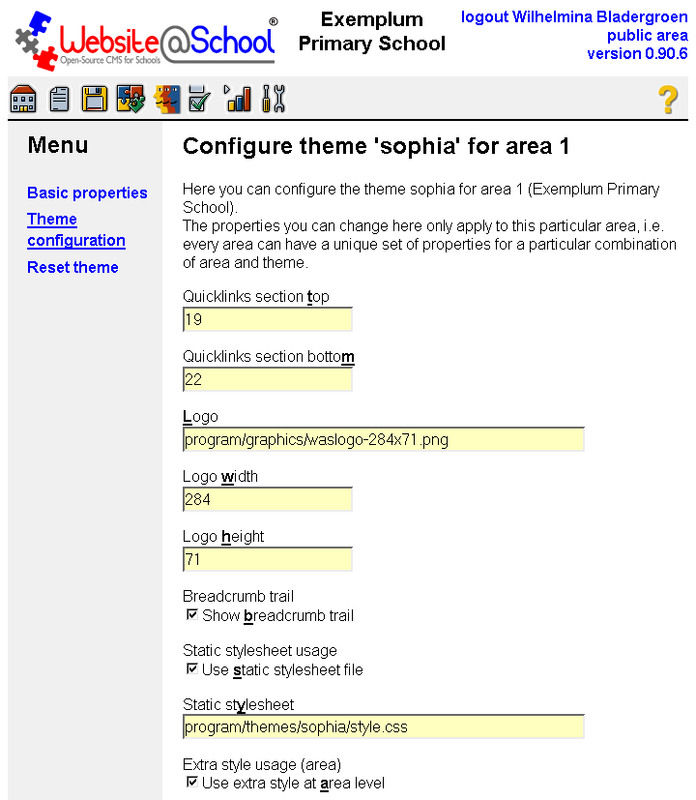 for Sophia in the themes directory, visible at http://exemplum.eu/program/themes/sophia/. Please take a peek at its contents on your schools site. Your own created files can best be put in the directory for the created Area. Use the File manager and navigate to /areas/<yourarea> and upload your stencil file(s) and logo file there. See also the chapter File Manager, paragraph 5. Using files: file paths for the logo file.